Aim: Mandibular angle fracture is one of the common fractures which a maxillofacial surgeon faces, which has a variable etiology. The aim of this commentary is to present a rare case of a mandibular angle fracture caused by heavy bite force and amplified by the wedging action of impacted mandibular third molar in a 29-year-old male patient. This is a first case report in the literature as per our knowledge, where a strong bite force caused a mandibular angle fracture, during heavy weight lifting in the gymnasium. Conclusion: The consequent fracture was reduced with an open reduction and internal fixation under local anaesthesia. An unusual case of a mandibular angle fracture with a very uncommon etiology of heavy bite force has been presented here with its management. Clinical Significance: This commentary discusses the relationship between the normal bite force, force required to fracture the mandible, and how a fracture of this kind can affect a person involved in non-contact sports. Ladeinde AL, Adeyemo WL, Ogunlewe MO, Gbotolorun OM. An unusual fracture of the mandible. Ghana Med J 2009;43:179. Kumar PS, Dhupar V, Akkara F, Kumar GA. Eruption status of third molar and its possible influence on the location of mandibular angle fracture: A retrospective analysis. J Maxillofac Oral Surg 2015;14:243-6. Perez R, Oeltjen JC, Thaller SR. A review of mandibular angle fractures. Craniomaxillofac Trauma Reconstr 2011;4:69-72. Rowe NL, Wiilliams JL. Maxillofacial Injuries. Edinburgh, London & New York: Churchill Livingstone; 1985. Jain V, Mathur VP, Pillai RS, Kalra S. A preliminary study to find out maximum occlusal bite force in Indian individuals. Indian J Dent Res 2014;25:325. Cutilli T, Bourelaki T, Scarsella S, Di Fabio D, Pontecorvi E, Cargini P, et al. Pathological (late) fractures of the mandibular angle after lower third molar removal: A case series. J Med Case Reports 2013;7:121. Mihalik JP, Myers JB, Sell TC, Anish EJ. Maxillofacial fractures and dental trauma in a high school soccer goalkeeper: A case report. J Athl Train 2005;40:116. Kwon IJ, Lee BH, Eo MY, Kim SM, Lee JH, Lee SK, et al. Pathologic mandibular fracture after biting crab shells following ramal bone graft. Dent Traumatol 2016;32:421-4. Lee J. Treatment of mandibular angle fractures. Arch Craniofac Surg 2017;18:73-5. Singh RK, Pal US, Agrawal A, Singh G. Single miniplate osteosynthesis in angle fracture. Natl J Maxillofac Surg 2011;2:47. Yadav S, Tyagi S, Puri N, Kumar P, Kumar P. Qualitative and quantitative assessment of relationship between mandibular third molar and angle fracture on North Indian population: A clinico radiographic study. Eur J Dent 2013;7:212. Zhou H, Lv K, Yang R, Li Z, Li Z. Mechanics in the production of mandibular fractures: A clinical, retrospective case-control study. PLoS One 2016;11:e0149553. Halmos DR, Ellis E, Dodson TB. Mandibular third molars and angle fractures. J Oral Maxillofac Surg 2004;62:1076-81. Fraser LA, Adachin JD. Glucocorticoids induced osteoporosis: Treatment update and review. Ther Adv Musculoskelet Dis 2009;1:71-85. Anyanechi CE, Saheeb BD. 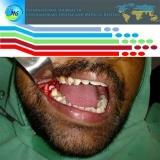 Mandibular sites prone to fracture: Analysis of 174 cases in a Nigerian tertiary hospital. Ghana Med J 2011;45:111-4. Rajkumar K, Ramen S, Chowdhury R, Chattopadhyay PK. Mandibular third molar as a risk for angle fractures: A retrospective study. J Maxillofac Oral Surg 2009,8:237.